Here it is, something new—our first Reader Panel Boat Test! 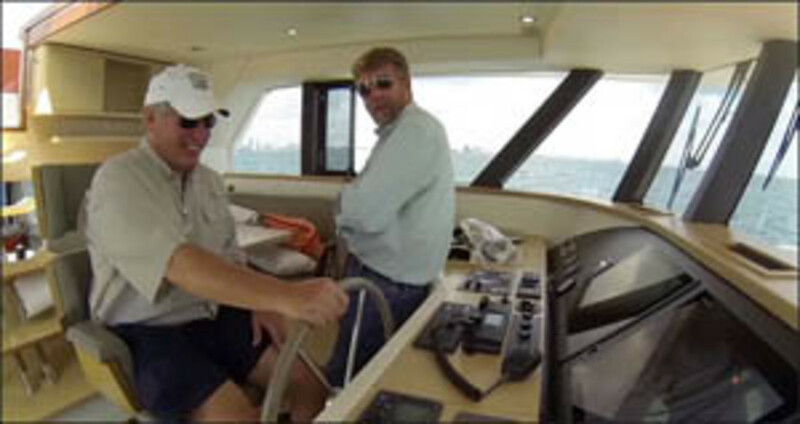 To find out what two of our readers— as well as our sea-savvy boat tester Capt. Bill Pike— think of the Garcia Trawler 54, just keep on cruisin’. 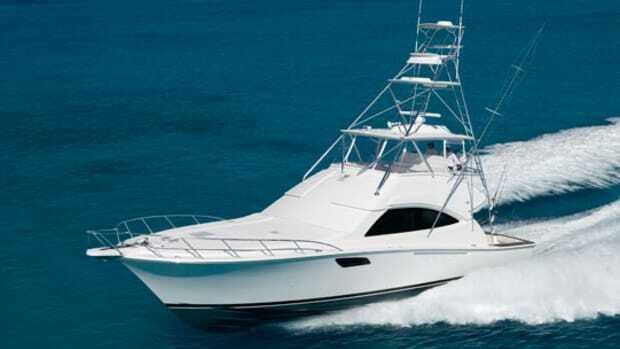 The Garcia Trawler 54 was born to run, and run, and run. On her maiden voyage from Cherbourg to La Grande Motte in southern France she reportedly covered 1,800 nautical miles in nine days while burning 3 gph and doing an average speed of 8.1 knots. Her second voyage produced the same slo-mo efficiency and took her across the Atlantic on her own bottom for a stateside debut at the Annapolis Powerboat Show. Given such accomplishments, it’s reasonable to suggest that the 54 is the kind of vessel that might take her owner just about anywhere. But the 54 has attributes that are much less performance-related than those just mentioned. And taken together, they make her an exceptionally interesting vessel, particularly from the standpoint of boat testing. 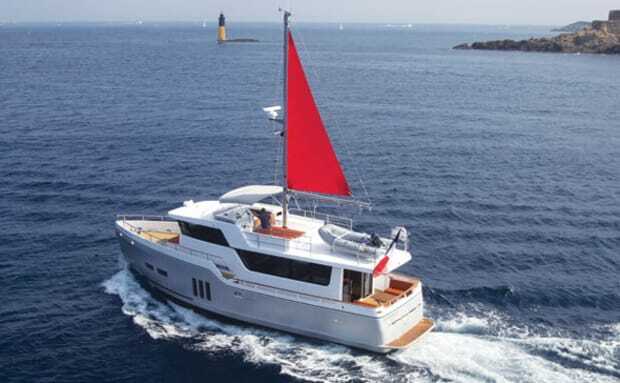 So when the editors at Power & Motoryacht began putting together a new (and we hope improved) method for testing boats, the 54 (with her big, red steadying sail, bright-aluminum finish, and relatively light, albeit hell-for-stout hull form) seemed like an ideal test bed. Bottom line, we wanted a vessel that would prove exceptionally engaging, as much to one of our boat-testing staffers as to the members our new Power & Motoryacht Reader Panel, a select group of 12 serious boaters from all over the country who’ve kindly volunteered to join us periodically in twos and threes for boat tests and then, with only a modicum of editing, report upon their findings. 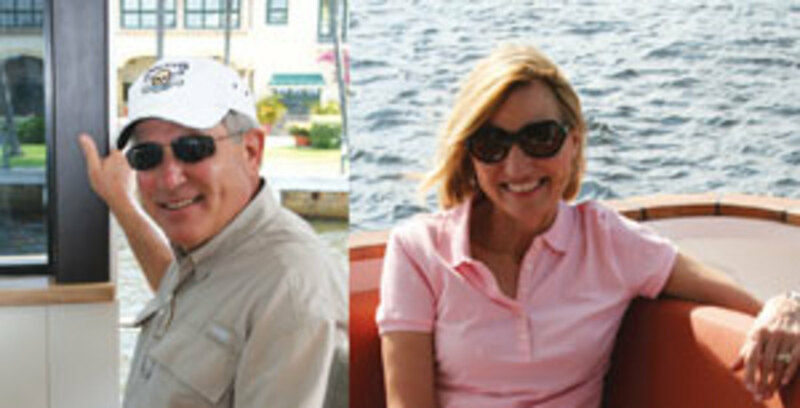 The couple we picked to join us onboard the 54, by the way, were long-time boaters Carol and Robert Brathune. Who Are These Nice Folks? Robert Brathune grew up in Baltimore, Maryland, and began boating as a kid on his father’s 25-foot Chris-Craft cabin cruiser. He is a 1973 graduate of the U.S. Naval Academy with multiple semesters spent there learning navigation and pilotage, seamanship, celestial navigation, and other marine disciplines. Besides having practical experience as a sailor onboard 24-foot Rainbow Class Knockabouts and 44-foot Luders Yawls, he is a naval aviator with multiple extended cruises as a carrier-based fighter pilot. Carol Brathune lived on the St. Johns River in Jacksonville, Florida, until she departed for college in her teens. Although her parents owned a succession of watercraft, her real love of boating began when she and her husband bought their first powerboat in 2006. “The first overnight trip we took,” she says, “I was hooked.” The Brathunes currently own a Regal 5260 Sport Coupe and live in Ponte Vedra Beach, Florida. When I received a call from Capt. Bill Pike, Power & Motoryacht’s executive editor, about being one of the first folks to participate in a Reader Panel Boat Test, I was pretty excited. And when he said the test would feature a new, French-built, long-distance trawler, I was even more excited, since long-range cruising is one of my major interests these days. When I renounced a two-to-three-times-a-week golfing habit to buy a boat eight years ago, my motivation was the need for adventure. 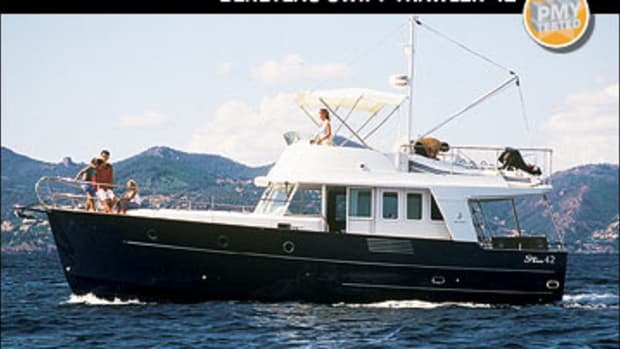 And what could offer more of that than a 54-foot trawler like the Garcia that has the legs to cross the Atlantic? So, to say the least, I was very interested in looking the boat over and comparing it to the Marlows, Flemings, Nordhavns, Selenes, and other similar craft I’ve been seeing over the years at the Miami International Boat Show. My first impression was how different the 54 was from virtually everything else I knew about. The lines are very clean and simple, with a contemporary, European flair. The unpainted aluminum hull eliminates much of the exterior maintenance I would guess, and provides great strength at very low weight. And the ample bulwarks provide safety and protection. I liked how the galley blends into the saloon and helm area. Both my wife and I agree this would make an ideal party boat for our many Gator- and Jaguar-game tailgate parties on the water. I did feel, though, that some of the amenities you see on other boats in this size range were lacking. Electrical outlets, for example, were of the European type and very scarce. Garcia is certainly into the minimalist approach over all, with a light displacement, a small single Caterpillar diesel (with back-up wing engine from Volvo Penta), low fuel consumption, and Spartan accommodations, amenities, and instrumentation. And perhaps because of the company’s sailboat emphasis, the 54 seems to share more similarities with its sailboat brethren than many of the larger, heavier, more powerful, long-range cruisers I’ve just mentioned. The doors were not as heavily made, nor did they have the heavy-duty latching mechanisms I think are necessary to withstand potentially violent conditions during open-ocean travels. Moreover, the windows were large, which made the interior very light and airy, but again I wonder about violent seas pounding against such expansive areas of low-lying glass. 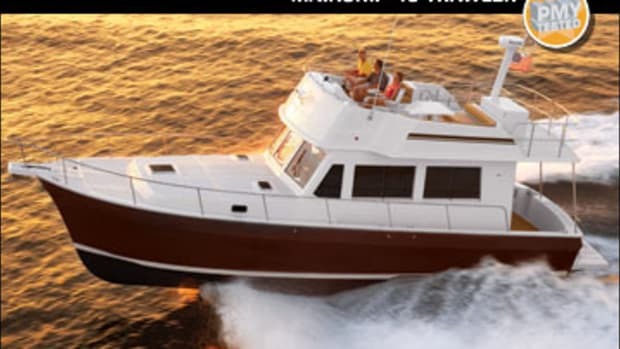 Of course, I’ve read about the Garcia Trawler 54 negotiating the outskirts of tropical storm Nadine in the Atlantic and experiencing 16-foot seas, so it is hard to challenge the boat’s rough-water capabilities. But frankly, for something like an Atlantic crossing, I’d go with stouter watertight doors and windows, storm covers to protect all that glass, and more horsepower to contend with strong winds and currents. I was glad to have the opportunity to drive the boat. She handled well with very quick response to helm commands. But the instrumentation at both upper and lower helms was installed flat, instead of at an angle, so I was unable to see it while seated. 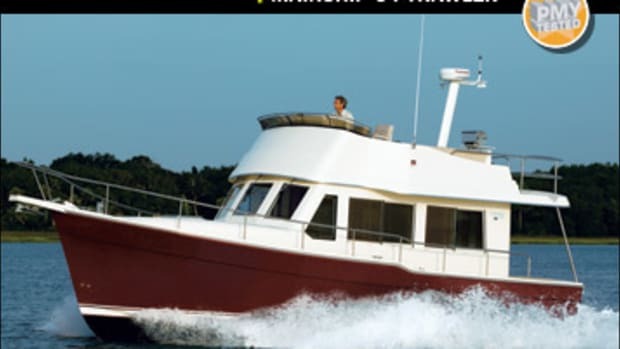 And given the insubstantiality of the bimini, I think the boat could use a hardtop, especially for cruising in Florida. 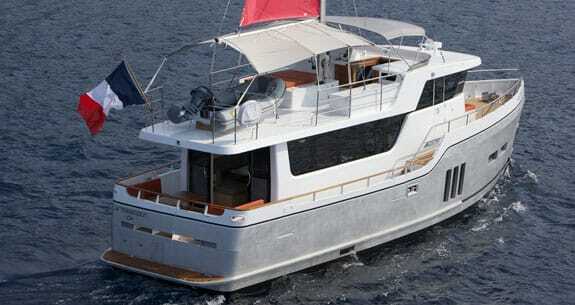 My opinion of the Garcia Trawler 54 is provisionally positive, though. 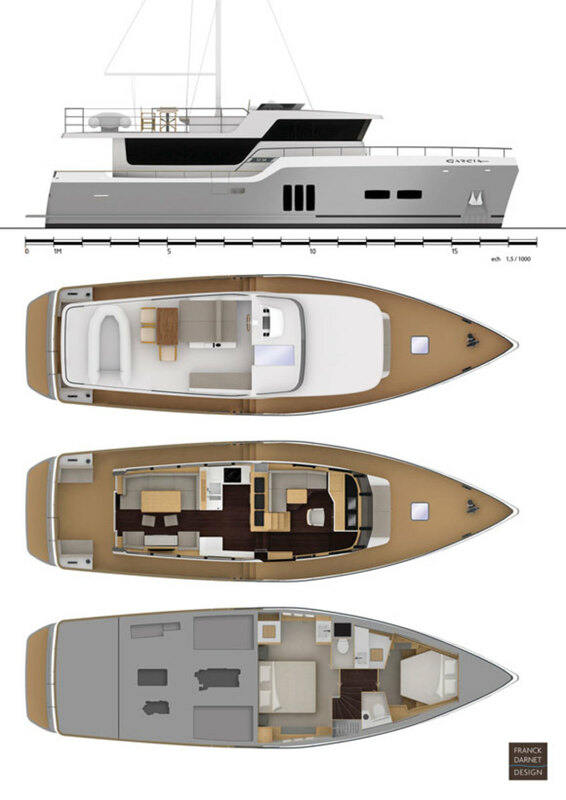 I like her simple, less-is-more approach to outfitting and engineering, and with a few tweaks and a little more attention paid to the U.S. powerboat market, I’d say Garcia can easily perfect this salty long-range cruiser. My husband Robert and I are thrilled to be in on the ground floor of Power & Motoryacht’s new concept: having readers—real boaters—join an editor during a boat test and afterwards independently present their own opinions within the test report. Robert and I are a team on our Regal 5260 Sport Coupe. Robert stays in the air-conditioned helm area during dockings and I as first mate get to handle the lines in the heat, rain, and lightning. I sometimes also get to play the role of galley slave. All kidding aside, though, I’ve noticed over our many years of boating that my husband and I have totally different perspectives on what makes a boat really special. He concentrates on handling, navigation, propulsion, and safety, and I am more concerned with design, creature comforts, function, the galley, and entertaining. During our boat test, I found that getting on and off the Garcia 54 was easy, with no unmanageable steps to deal with. 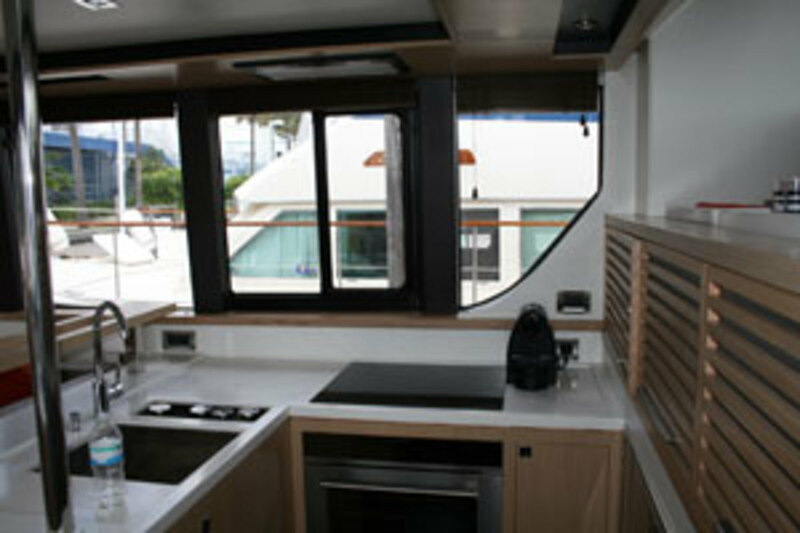 The wide walkaround decks are a feature that any first mate will appreciate when the weather and seas are uncooperative. The large double-glass-doors at the aft entry are very nice. They open into a spacious saloon that is bathed in a great deal of natural light. The saloon seems like the perfect place for a large number of guests to gather. It is built around a large flat-screen TV, which would be great for our family since much of our entertaining takes place during football season. Like my husband, I absolutely loved the galley. Because it’s an extension of the saloon, it allows the hostess to be part of all the activities that go on there. The cabinets are well thought out with good stowage and the design is very functional. The furnishings throughout the boat remind me of IKEA furniture, where function is the operative design criterion. Robert says that the weight of the boat was a major consideration in its design and this furniture helps achieve a minimal displacement. Arrangements in the master cabin and VIP mirror the same type of style—not luxurious, but functional. Stowage in the berthing spaces was minimal, however. In the master, the area devoted to the small walk-in closet could be greatly enhanced by adding hanging space and drawers. One thing that we particularly like about our own boat is that the sink/vanity/head area is separate from the shower. This allows one person to shower and then leave the steamy environment (to fix hair, make-up, etc.) while another person showers. Unfortunately, the 54 we looked at did not have this kind of layout, although I believe Garcia is amenable to swapping the locations of the head and the shower to produce it. There are never enough electrical outlets in the vanity area for curlers, blow dryers, and the like and this was especially true of our test boat. It is also wise to put the outlets on separate breakers. I know because I am always overloading ours. 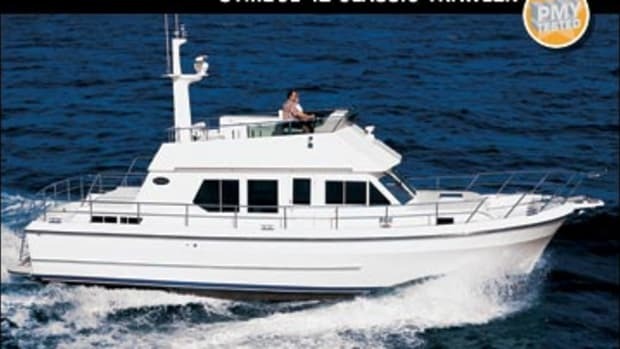 In conclusion, the Garcia Trawler 54 seems like a comfortable, attractive boat. 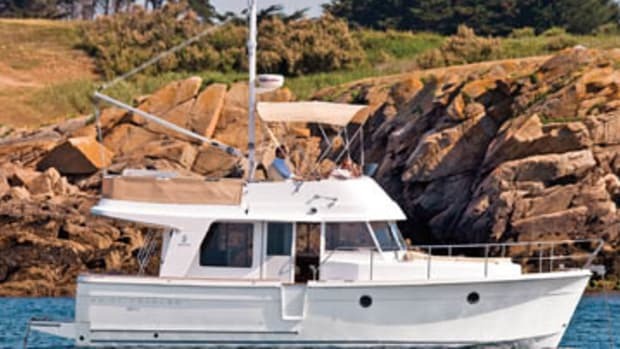 It would be ideal for cruising, although for reasons my husband has stated I am not sure I would sign on for anything much beyond coastal jaunts and an occasional trip to the Bahamas. 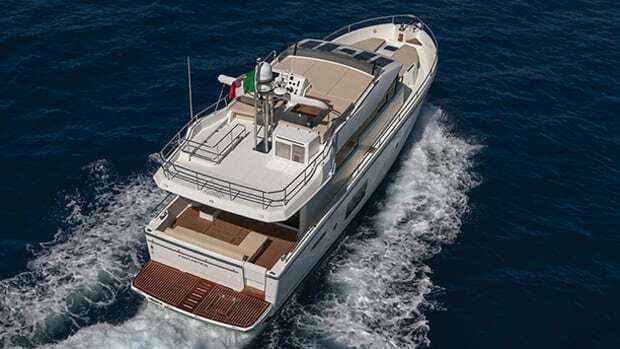 I especially like its potential for entertaining a large number of guests both on the main deck and up top, on the spacious bridgedeck. We are not talkin’ speedboats here. 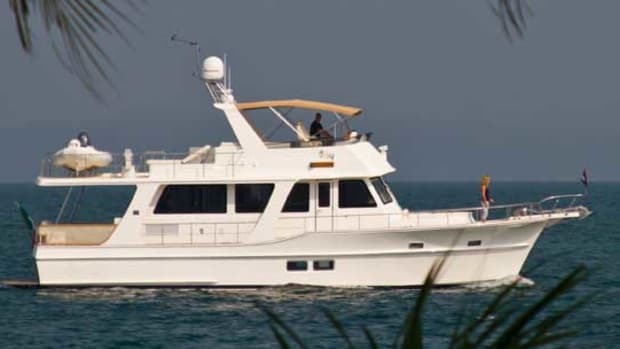 The Trawler 54 is a round-bottomed displacement watercraft designed to achieve a hull speed of roughly 10 knots efficiently and, while doing so, keep her occupants reasonably comfortable, especially during long-haul, bluewater excursions. We sea-trialed the 54 on the coastal Atlantic near Ft. Lauderdale under comparatively balmy conditions, with light winds and 1- to 2-foot seas, just a few days before she was scheduled to make her way back across the Atlantic to her home port in France. The ride at the boat’s 9.6-knot average top speed was smooth but determined, thanks to a gentle roll (neither overly abrupt or lazy) we found we could lessen considerably by deploying the steadying sail. We also found, interestingly enough, that we could boost our speed by approximately 1 knot at a cruising velocity of roughly 8 knots by deploying the sail, at least when we were oriented beam-to to the southwesterly breeze. Coming up with GPH and range numbers proved impossible, however, since neither upper nor lower helm stations had fuel-burn monitoring capability and both tachs were reading 2500 rpm at WOT, much higher than the 2100 rpm our de-tuned Caterpillar 3056-TA should have been turning. To offset these difficulties, the Garcia rep onboard offered some plausible-sounding numbers averaged during the 54’s Atlantic crossing: 3.2 gph at 8 knots, yielding a range of approximately 3,100 nautical miles with a 10-percent reserve. While the 54’s forte is long-distance cruising, she’s very maneuverable. 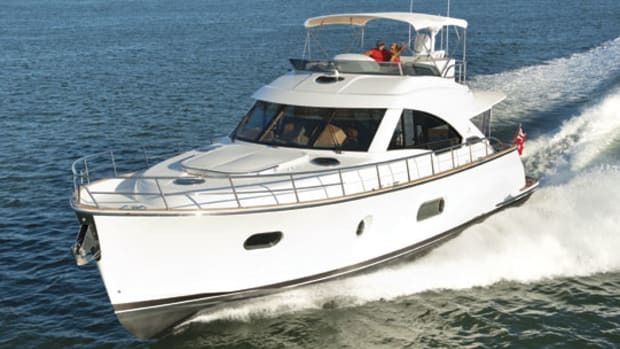 When docking the boat stern-to at the Bahia Mar marina in Ft. Lauderdale after our sea trial, the pivot I had to make at the mouth of the slip brought the boat’s bow so close to a motoryacht across the fairway that her crew came to the rail in wide-eyed alarm. Nevertheless, the heft of the 54, in conjunction with her two staunch MaxPower electric thrusters (fore and aft), imparted an unhurried precision to the process and produced nary a whiff of trouble, despite the modest breezes wafting about. Despite the heft just mentioned, the boat is not radically heavy. Her all-aluminum construction keeps the pounds down, at least by comparison with most similarly sized long-rangers built in FRP. But this does not preclude strength. Everything structural onboard is beefy, TIG- or MIG-welded aluminum, including longitudinal and transverse frames, engine keelsons, bilge, garboard, and other strakes, shell plating, decks, bulkheads, fuel tanks, and the whole superstructure. Engineering details include a solid sound-and-vibration-attenuation program. Accommodation spaces are completely insulated from the hull and deck with polyethylene foam panels. And the engine room is also insulated using fireproof-sprayed polyurethane foam, Rockwool panels, and sound-insulating materials finished with perforated aluminum. Check out the sound-meter readings we recorded at the upper helm station during our trial—they’re exceptionally low, in large part due to all the insulation. The 54s machinery spaces, however, get a mixed review. On the one hand, access to the lone Caterpillar diesel in the engine room was excellent (with diamond-plate aluminum walkways on either side) and access to the Volvo Penta D2-75 Saildrive wing engine was just about as good. Moreover, duplex fuel-water separators from Parker Racor were 75500Max high-capacity models, a sensible choice for a long-range vessel. And clean-outs in the two white-painted saddle-type fuel tanks were large enough to serve effectively. But then, headroom in our 54’s engine room was of the stoop variety—just 56 inches, well under 5 feet—and the electrical wiring in evidence was far from crisply laid out and installed. But hey, the exterior cosmetics made up for these foibles. Our 54’s aluminum hull above the waterline was finished bright, although it was invisibly protected with colorless varnish. And the superstructure, decks, and upper sections of the gunwales were dealt with more conventionally, with three undercoats of epoxy primer followed by four topcoats of two-part polyurethane. After taking a long look, I’ve gotta say that combining the two finishing approaches makes for a strikingly salty appearance, for a strikingly salty bluewater cruiser. Noteworthy Options: Sea Recovery watermaker ($25,376); Samsung stereo/CD/MP3 player ($1,988); Axis closed-curcuit TV ($5,897). 700 gal. fuel, 47 gal. water, 5 persons, 1,000 lb. gear.